If you are just thinking about getting into astronomy, or do not want to spend too much money on a telescope, you can do no better than the Meade 20218 NG-70SM. This refractor telescope, produced by the biggest manufacturer of home telescopes, has the best features and quality available at the price. At just under 10 pounds in weight, it’s also very easily carried around, so you can take it out to the backyard, or on camping trips, and it won’t be a pain to transport. 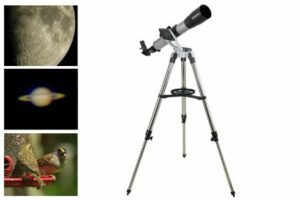 Looking at customer reviews on many different sites, like Amazon, you will see that this telescope is very highly praised, being seen as a lot of kit for the money, and I believe, the best choice for beginners. Telescope tube with 70mm aperture, and 700mm focal length. The mirrors are very high quality, and the angled viewing piece means you can get the telescope at a comfortable angle easily. 25mm Eyepiece, with 28x magnification. 9mm Eyepiece with 78x magnification. These big 1.25mm eyepieces give you a wider field of view than most smaller eyepieces, and a higher magnification. The reason is because they let in more light, and the more light you can collect, the higher magnification images you can see without distortion, or fuzziness. Altazimuth Mount with tracking dials. This is a very high quality mount, which at this price point is a great feature. The mount has hand controlled dials that rotate with precision in both axes, (up/down, left/right), and the quality construction allows the user to track an object with great ease and accuracy as it moves around the sky. Again, this telescope has probably the best quality tracking system for the money. Steel leg tripod with accessory tray. Unlike many telescopes in this price range, the Meade 20218 NG-70SM legs are made from steel, not the more common Aluminum, which provides a very sturdy platform. This helps to prevent the telescope from shaking during use, giving you clearer images. Extra rigidity is provided by the handy accessory tray, and the leg height is adjustable to get exactly the position you want. Instructional DVD. The kit comes complete with AutoStar Suite Astronomical Edition PC software, which is easy to set up, and has a database of over 10,000 objects for you to find. You can print out star charts, or just locate planets, galaxies, nubulea and stars. If I have any criticism of the Meade 20218, it’s that upgrading to a more powerful lens type, such as a Barlow lens, will nearly double the price, which isn’t really a criticism of the telescope, more an observation of how affordable it is. But a Barlow lens, which will double the magnification, can of course be bought at a later date. Meade advertises this telescope as being ideal for terrestrial viewing (bird watching etc,) so you can get dual use out of the one item, although I have not seen much evidence of people using it for anything other than astronomy, which is really what it is designed for.